Fig. 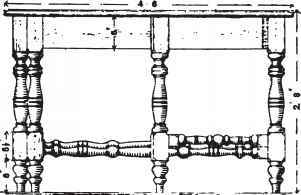 37.—Joints in Framework of Fàlling-leaf Table. Fig. 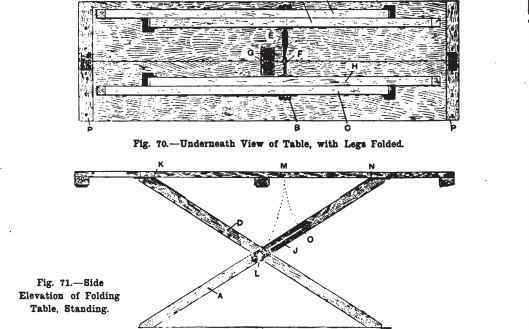 88 - Plan of Framework of Falling-leaf Table. Fig. 89.—Side Elevation of FalUng-leaf Table. Fig. 40. End Elevation of Falling-leaf Table. Fig. 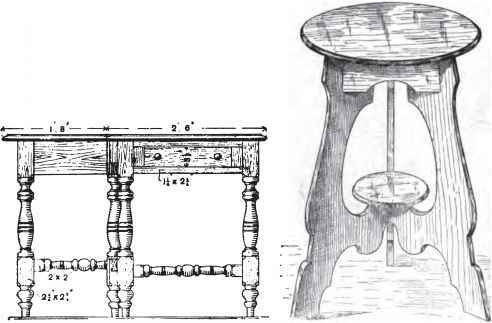 42.-Small Table with Round Top. Fig. 41.— Joint between Table Top and Flap. method of connecting the rail and movable legs to the main rail is by inserting a flat-headed bolt secured on the under side with a nut; but a stout screw answers. 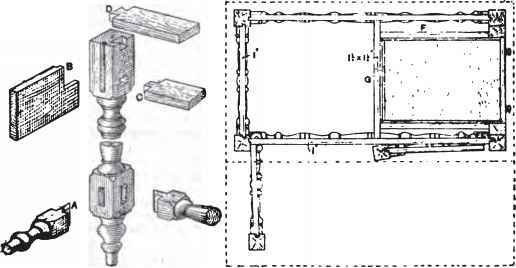 The drawer, fitted at one end, may be the same width as the distances between the legs, or it may be narrowed, as shown, by inserting a block at each side. In the latter case the runners F (Figs. 3G and 38) should be fixed into the lower front rail, and another rail g at the back. If the drawer occupies the whole width, the runner can be fixed to the broad side rails. The drawer is of the ordinary dovetail construction. Next prepare the top. If hardwood is used, the best plan will be to join the pieces by dowelling and gluing them together. If pine or similar soft wood is used, the joint should be ploughed, cross-tongued, and glued together. Figs. 35, 39, and 40 show the edges of the top moulded, and the joint between the top and the flap would have a much better appearance if the inside edge of the flap were hollowed, so that when the flap is down the moulded edge would be in the form of a rule joint, as shown at Fig. 41.